Lackluster phone upgrades didn't help. For a while, it seemed like the Chinese smartphone market was an infinite growth machine. Companies would have rough patches, but the overall field would always be on the up and up. Well, those days are over. 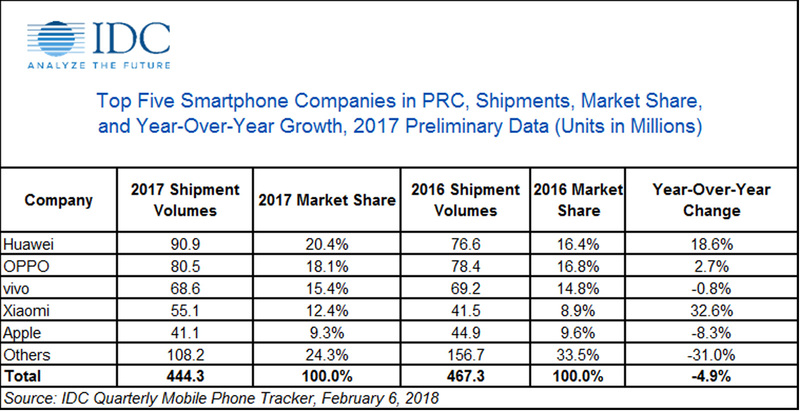 IDC estimates that Chinese smartphone shipments declined 4.9 percent in 2017 -- the first drop since 2009. The analyst firm pinned it primarily on "minor upgrades" to Chinese phones that weren't enough to spur a wave of new buyers. We'd add that the market is maturing. Much of the rapid growth from past years was sparked by a burgeoning Chinese middle class buying its first smartphones. Many of the people who could afford smartphones have them, and they aren't always in a rush to upgrade. Not that the biggest phone makers are necessarily complaining. The drop mainly applied to smaller brands, whose shipments plunged 31 percent -- the top five (Huawei, Oppo, Vivo, Xiaomi and Apple) saw their numbers either dip only slightly or go up. The juggernaut of the bunch, Huawei, saw its shipments climb nearly 19 percent thanks to a range that covers everything from the lower end (like its Honor line) to high-end hardware like the Mate 10 Pro. And Xiaomi, despite past troubles, saw its shipments jump a staggering 32.6 percent. When big companies suffered, it was usually due to inaccessible lineups. Vivo shifted away from low-end models in 2017, while Apple's premium range limited its real success to "tier 1" cities like Beijing or Shanghai. If there's a consolation prize, it's that high-end phones were having a field day last year. Apple dominated the space above $600, and Huawei's slice of that market jumped from 2 percent at the end of 2016 to 8 percent a year later. BBK's Oppo and Vivo badges may have taken a bruising in terms of sheer numbers, but their shift away from lower-end phones helped them make more money overall. The question is whether or not that's a viable strategy in the long run. While targeting luxury buyers can be lucrative, there are only so many of them to go around in a country where the average worker brings in just over $10,000 per year. Those companies that care about more affordable devices will still have to court budget buyers if they want to thrive in China.